Kylo Ren from Star Wars: Episode VII - The Force Awakens! Astonishing canvas art print measures 21 1/2-inches tall x 16-inches wide. Signed by artist Randy Martinez! Limited edition of just 95 hand-numbered pieces. From Disney's much-anticipated sequel to the ever-popular Star Wars series, comes an astonishing art print of antagonist Kylo Ren. 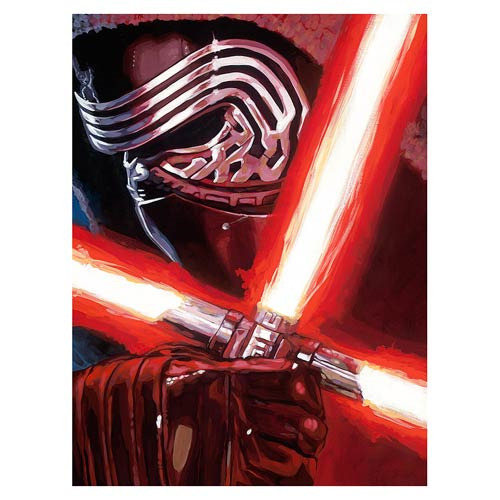 This unframed Star Wars: Episode VII - The Force Awakens Dark Warrior Kylo Ren Canvas Giclee Art Print features the dark side villain wielding his red lightsaber, complete with crossguard. Printed on canvas and measuring 21 1/2-inches tall x 16-inches wide, it's a limited edition of just 95 hand-numbered pieces, signed by artist Randy Martinez! Ages 13 and up.